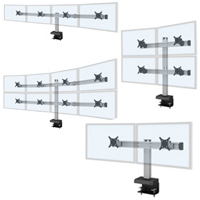 The Bild is a multi-monitor mounting system that can be easily configured to meet a wide range of applications. 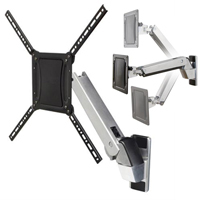 Starting with a dual mount system, users can build almost any multi-monitor system by adding just the components that are needed, making the Bild an easily modifiable mounting option. 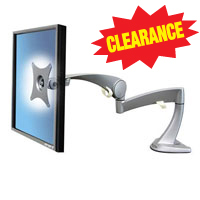 The design of the Bild also makes it easy to add, adjust, or remove monitors. Additional beams can be added to the base unit and positioned flat or in an arch for the best viewing angle. 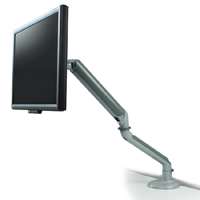 Sliding mount cups allow easy positioning of monitors. 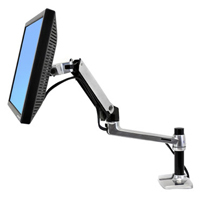 Also, an optional height adjustable base is available for multi-user workstations where users of different heights can set the monitors at their own optimal height. Desk mounting options include desk clamp, through mount, or rail mount. Beam mounting options include pole mount, static column mount, or motorized column mount. Available in silver or black. The product components for a Dual Bild with through mount and static column in black are as follows: BILD-2-NM-104 (x1), 8480-16.5-TM-603 (x1). The product components for a Triple Bild with through mount and static column in black are as follows: BILD-3-NM-104 (x1), 8480-16.5-TM-603 (x1). The product components for a Quad Bild with through mount and static column in black are as follows: BILD-2-NM-104 (x1), 8470-20-104 (x2), 8477-HQ-104 (x2), 8480-16.5-TM-603 (x1). For other mount configurations, please call. 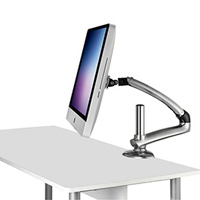 The Freedom Arm for Mac from Ergotech Group is a versatile, economical articulating arm for use with most Apple iMac and Thunderbolt/Apple Cinema Displays. This pole-mount-style desk clamp model has a spring mechanism allowing 14 inches of total height adjustment along an 8" pole and 23.4" of horizontal adjustment; aluminium dual arms for articulating at two points; and a spring tension tilter which tilts at 90° up and 45° down (pan is 180° and rotation is 360°). 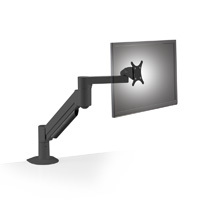 The arm has a weight capacity of 20 to 30.8 lbs, and there are two models accommodating monitors that either are VESA-compatible for 75 x 75 or 100 x 100 (mm) hole patterns or mount directly to your Mac. Warranty is 3 years. NOTE: Freedom Arm for Mac is not compatible with the Retina 5k display iMac. NOTE: The new thin model iMac (2012-present) is now made with a non-removable stand and MUST be ordered from Apple with the VESA mount built into it (instead of a stand) in order to attach the arm. 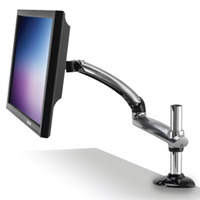 The Freedom Arm for PC from Ergotech Group is a versatile, economical articulating arm for use with most LCD monitors under 27". This pole-mount-style desk clamp model has a spring mechanism allowing 14 inches of total height adjustment along an 8" pole and 23.4" of horizontal adjustment; aluminum dual arms for articulating at two points; and a spring tension tilt mechanism which angles at 90° up and 45° down (pan is 180° and rotation is 360°). 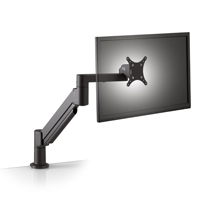 The arm has a weight capacity of 8.4 to 17.8 lbs, and will accommodate VESA-compatible monitors. Warranty is 3 years. A Heavy Duty model (FDM-HD-S01) with a weight capacity of 20 - 30.8 lbs is also available for heavier monitors. The Interactive Arm - HD from Ergotron offers an extensive range of light-touch adjustment for TVs weighing from 18 to 40 pounds. This "Constant Force" arm has a 20" vertical adjustment range and can shift up to 17.5" to both left and right sides. It can extend up to 24" from the wall at maximum extension but still fold back to just 5.5". With Tilt and Pan functions this arm lets a TV be positioned to offer the perfect viewing experience, eliminating frustrating glare from lights or windows. 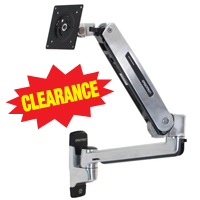 This arm will fit TVs equipped with VESA mounts from 200x100 to 600x400. See this PDF for full specifications.